I hear they finished turning the Oak Cove back into a hotel. The big influx to Flag hasn’t been so big. Now they have too many empty hotel rooms, too many idle Russian housekeepers and maids, and too little income. So, the solution, as always: put on the squeeze. They are “losing money” because some out of town people would rather rent a room or apartment by the month than pay for a room at the Friendliest Place In The World ™ by the day. For many it is not even the cost, its the fact that you cannot escape the regges/fundraisers/vultures at ANY time. Just another indicator that things aren’t all hunky dory at the Mecca of Dave’s Technical Imperfection. When I went to Flag for training, my organization was paying $1,100/week for my lodging. This wasn’t in the Ft. Harrison. It was at an apartment complex where staff were living. I got there at 11:00 PM, exhausted from traveling and the long process to route in. I waited over an hour for someone to help me. Finally I was given a room in an empty apartment. The bathroom had black mold on the ceiling and damage from water leaks was visible in the bedroom. I spent the next day cleaning the space after having to buy cleanser, etc. from a store nearby. The place was noisy with staff coming home on buses and standing outside my window smoking and talking until wee hours of the morning. One night I came home and found another family living in the apartment. I found someone who told me that I had been moved. He walked me over to a new apartment, which I had to clean once again on my own dime. Another night, I came home to find that my room had been “cleaned” by taking all of the bedding to be washed. I slept in my clothes on a bare mattress. Another time, someone showed up at my door demanding proof that I had paid for the room, because she wanted to move 12 staff into the 2 bedroom apartment. The laundry room had 6 inches of water on the floor. Staff would come home and find the electricity to their living spaces turned off until they cleaned (including vacumning) their space. This required that they disturb their neighbors to string electric cords to the other apartments. I checked to see if I could move into better lodging, but I was told that it would cost $2,500 per week to stay anywhere else. I was there 3 months. I finished my training as fast as I could and got out of there. If I had been better prepared or knew the conditions, I would have arranged to rent a room in a house and paid for a rental car. It would have been nicer, more stable, and cheaper. My whole view of Flag was tarnished by that trip. Flag is not for normal people. It is for the very rich and slaves who serve them. So I guess it goes without saying that they expect you to eat at their restaurants as well? Do they send you to ethics if they find out you eat at a non-Sci restaurant? Oh, and is it true you don’t get cable in their hotel rooms? And did they take the auditing look in systems out of the auditing rooms before they made it into a hotel? Or are they watching you undress? The CofS is a dangerous blend of “religion” and commercial enterprise. We can give into speculations about the history of traditional religions, but these two should not be blended together like this. Religion concerns itself with spirituality of man; commercial enterprise is focused solely on the “bottom line” practically at the expense of anything else that is within legal scope or even illegal when business can get away with it. When spirituality and modern business philosophy collide, you get a highly dangerous “creature” like The Church of Scientology that just “processes” people for the sake of bottom line alone and with an eye on high short term returns just like any corporate system today. What is best for people and their well being is tossed aside to yield way to considerations of what is legal or can be gotten away with to make as much money as possible regardless of whether it actually harms anyone in the process. How do staff and public continue to justify to themselves the atrocious order of this organization is beyond me. An organization like this purporting to be a “spiritual practice” yet placing its own bottom line at the expense of the well being of its parishioners has no place in existence. I went to Flag only once, for OTIV. It was in 1982 or 1983. I found the whole experience revolting. The mood was threatening, not friendly. HGC staff were irritable and exhausted. My auditor had the energy of a wet mop and was no more interested in me than if she’d been a counter clerk at McDonald’s. That’s a little strong, but in every session I felt I was keeping her from something she would have preferred to do. Every one of us KNOWS that it’s how you’re treated that makes you come back for more services. Any organization that treats their customers the way that Flag treats their customers would and should have collapsed 30 years ago. i may be wrong here but it seems like a possible angle that could rock the foundation. they book money on account in lieu of services. so there is and must be a public record of those accounts. they have a refund policy, which i do believe was required by the IRS for their exemption. why wouldn’t it be incumbent upon the IRS to review and audit those accounts to ensure that scientology is solvent? that they could in the event of mass refund requests, fulfill their refund policy. that would force scientology to show the money, where it is and how much or face some sort of penalty. if solvency is a requirement to qualify for tax exemption, there must be a review mechanism to ensure the exempted remains solvent. Well, the truth is that anyone with a lawyer (and Miscavige has plenty) can avoid inurement claims quite easily. He doesnt take an exorbitant SALARY (exorbitant by Sea Org standards certainly, but NOT by exempt org standards where the CEO of National Geographic is paid HIGH 6 figures) and he does not have a big house (he has “facilities” all over the world dedicated to him that are lavish, but not by IRS standards), the church provided cars are all well within acceptable standards (and his expensive vehicles and motorcycles are “gifts” done by “donations” of staff for his birthday and XMas etc). His clothing is within acceptable limits set by the IRS. The private jets are OK too. It may be extravagant compared to what is expected of a “Sea Org” member and in comparison to everyone else AND a horrendous waste of money, but its not in violation of the tax code. The IRS position on this is that this is something between him and his flock — if they don’t agree with his extravagances they can stop giving and join another church or depose him. why i say that is because from what i understand the IRS insisted that they have a refund policy as one of the conditions for getting approved. so i’m thinking that the IRS has to review exempted groups once in a while to make sure they are still in compliance and still meet the criteria. so if a sound refund policy was required as a condition for approval, when the IRS does their regular review, making sure that that refund policy is in fact still viable should be something they review. maybe they don’t have to show they can make restitution, and just having a policy saying they are willing to, is enough. it was just a thought. No, the IRS believed the church’s refund policy was an indicia of a quid pro quo transaction and thus nondeductible. But the church could not pretend such a policy did not exist (which would have been far easier), so defended it on the basis that it was not due to being a commercial transaction but that it was required due to being a religious tenet of Scientology — “the doctrine of exchange” ie that it is spiritually harmful to recieve without giving. I am not making this up. It is clearly in the IRS record. It is also laid out in Garcia lawsuit. It was not a requirement for exemption, in fact in many ways it was the opposite, a barrier to exemption. The Hernandez Supreme Court Case and the IRS Administrative record go into the “doctrine of exchange” in some detail. But I thought there were millions of members. Is this an April Fool’s? I’m going to buy you your very own goldfish or kitty. You deserve it. Yes, it’s the same Debbie Ward. Pat and her were married while in the G.O. at NY Org in the 80s, but divorced sometime after. She is remarried to Pat Murray, former Int crew and Melanie Seidler Murray’s ex. One of the biggest things that simultaneously angers me and amuses me is the church’s love of euphemisms to soften crass or obviously inappropriate activities. It’s amusing, but it’s also downright insidious. I don’t feel bad for you, Debbie. You’re taking advantage of people. So Flag has become the mandatory Grand Hyatt for all ‘public’. Now whatever you do, think or say and where you sleep is part of the Miscatastrophic Plan. The walls are closing in and the sheeple better leave the flock soon or they will be locked in tight forever. The Oak Cove should be for staff housing with a private room and a view. How about a kitty or a goldfish? Treat the staff with decency and respect, not like inmates. self determinism ( =clear) vs policy vs Salesmanship. the Catholic church just told their members no one is allow to list rooms for rent near saint peter’s square on FB because the pope hotel needs all the business it can get. can you imagine how desperate they would be if they weren’t expanding? It always used to piss me off sitting in one of the FH or Oak Cove resturants and see the reg teams descend on people eating either singly or in a group and if the person was on a session break they would not leave until guaranteed an appointment later in the day. The other pisser was the routine of check in see the MLO and the reg would be waiting for you to get your room key and hit you up before you got to the elevator…bastards! I can remember the time after the Oak Cove opened both it and the FH were full to capacity. How rapid the drop off has been, anyone in any doubt who’s ultimately responsible? Good point GTBO. Even one “addicted to the cool-aid” should be able to see this, as long as they understand the principle of management by statistics! The stats don’t lie. Especially the long-term stats. It’s as plain as day. Time to wake up from the trance and start dealing with what is. Something Can Be Done About It. It is Flag that says the group is all and the individual is nothing. Hi. 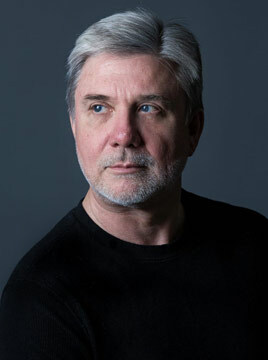 This is Tom Bodett for the Flag Land Base. Yeah, I know that you’re used to hearing me promote Motel 6, but, hey, these guys needed some help……and besides that, they’re paying me a lot of money to do this. Anyhow, they just asked me to ask you to please come to their Mecca. You don’t have to go to Saudi Arabia. It’s right here in Florida, but if you like slavery, harsh penalties, and stuff like that, they’ve got them too! So come on down to Flag. They’d leave the light on for ya, but that electric bill has been kind of high lately, so…..they knew you’d understand. what a bunch of crap. This kind of thing has gone on for years! In fact when I was on lines it was always stated as “off policy” even for those who had an apt or condo right there in Clearwater. You were sent to ethics. I just never bought into this crap. At the time I owned a condo and being told I was going to ethics, my response was bring it!! it was very nice with great view. Then exiled to a block house in the C.W. swamp. It was really cheap compared to the Oak Cove. There is suppression at Flag as described in the New PTSP course. The SP is happy when you lose and SAD when you win. The staff were so happy when I was jerked around so much I just wanted out. They were so SAD when I arrived for tons of services that cost a fortune. Very happy smiling faces when I routed out ,nothing delivered ,money on account gone. This didn’t take Sherlock Holmes or Albert Einstein to figure out. That is the environment when living a “Stat Driven Life” in the Sea Org – you want your whole group to suffer along with you. Human nature, I suppose – but I noticed that too! When a Sea Org staffer has nothing, is paid nothing, can’t do enough for the Organization while they were forced into “SACRIFICE” on the Tone Scale – it can turn some of them into nasty and down right evil beings! Idle Morgue, thanks for this good observation. Group culture and identity can be powerful things, too. For good or ill, I would say. I was really into Transcendental Meditation for a while and used to go on weekend retreats, sometimes at a hotel/training center the organization owned in Washington, DC. Most of the staff were essentially working as volunteers, I believe — trading time for services, in an arrangement that superficially resembles traditional Scientology staff work. But the group culture was different. I took an advanced course called the TM-Sidhi program, and a group of these former staffers, having fulfilled their contracts, were on the course as well. They turned out to be quite a varied lot, and mostly seemed to have enjoyed their staff time, on the whole. (TMers tend not to start the working day until late morning, after their morning “programs” of asanas, pranayama, meditation, and sometimes more advanced yogic stuff.) The only complaint I recall hearing was about the diet: rice and dahl, lots of rice and dahl. So I guess a strong group culture is not inherently a bad thing. I still find it a little creepy, in a Stepford Wives kind of way. But it does seem to be a phenomenon that can be easily manipulated and abused. About 1979 I was staying at the Fort Harrison with some other staff members, and one Sea Org who never was known. The door knob was inexistent and the “lock” was a filthy towel. I wonder if Debbie Kagan Murray is the same Debbie Kagan who married Pat Ward (OSA-NY) in the 80’s? I do know Debbie and her last name used to be Ward. Accommodations and how they are handled at Flag is just another example (though maybe more veiled) of the anti-social personality at work. Flag will take your money for a nice room but don’t expect privacy from late night regges./fundraisers and IAS beggars-That is not part of the deal when you check in. Remember, though you paid for it you don’t own that room or an expectation of privacy. Accommodations was always a bone of contention when I went out to Flag. I would get a call from Sondra (L. A.) and each time I had to explain I wasn’t going to stay on the base because it was simply too expensive. I use to get on Priceline and find a much better rate and amenities. I got into it with one of the accommodation officers one day and I told him I couldn’t understand why the church didn’t just drop their prices so the base would be a more attractive option for those of us coming in from out of town. This is supposed to be a non-profit endeavor so why charge rates higher than the local market? For speaking my mind and refusing to check out of the Holiday Inn Express I was rewarded with a Knowledge Report and a bucket load of pissed off. After that I was just looking forward to getting away from Flag as soon as I could. First, yes, it reflects the further dwindling spiral that Flag is. All that exerted pressure will ultimately have the effect of emptying out the place. Then COB can look in the mirror and give himself orders. Hard to clear a planet when you’re the only one. Yvonne Is the internet or cable TV not available at the COS hotels for the guests? I assumed they might have limited access through a censored/nanny version. It is 2014 after all. They have replaced the TVs with camcorders and hidden surveillance equipment. They don’t worry about what the guests want to watch…….. they are worried about who they are supposed to watch. 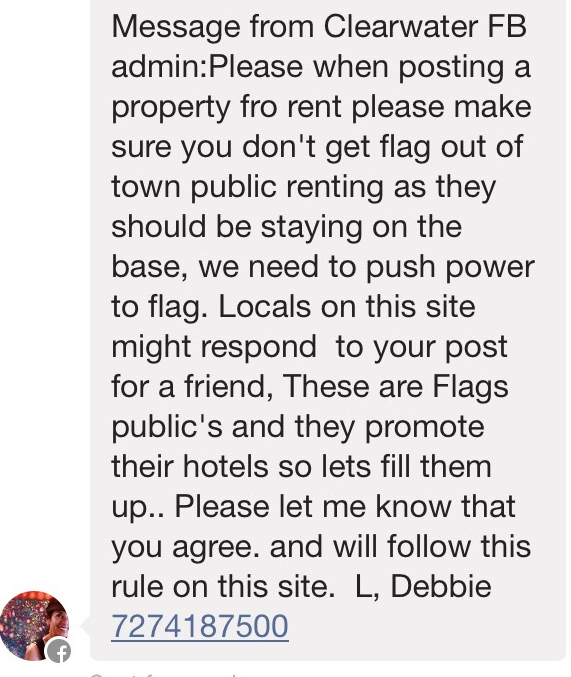 By the way, if you are a frequent Flag public, wouldn’t it in the long room be cheaper to actually BUY a small place in the area and rent a room to a full time person to take care of it and then just occasionally stay in the other room at your own home? 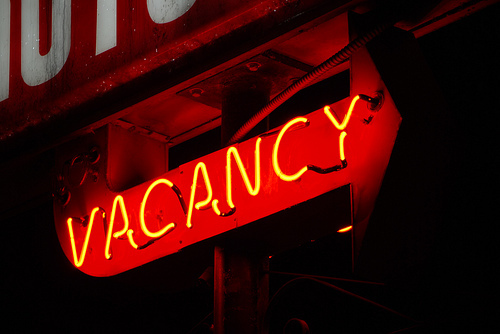 The Fraud Scam Base has certainly earned its vacancy rate of straight up and vertical! Heh – stay at the Fort Homicide so the regges can pick the meat off your bones. Carnival Barkers begging for money 24/7. It is awful! COMMUNISM in full bloom at FLAG! Many Scientologist’s are staying far away from the scariest place on the planet where you check in but can never leave. Welcome to the Hotel Scam-a-rama! Some excellent advice – Flow power to you, your family and you own bank account – stay far away from Flag and its vulture culture! If you go there to obtain the “Havingness Rundown” – you will throw dollar bills around a room while the regges pick your pockets! They will HAVE – you will not! Guaranteed!! “It is important to support the org to keep it there for all of us”. If Scientology was straight up and vertical like the Chairman of the Borg says it is, messages like this would be unnecessary. Cult is up in everyone’s business as usual. Exactly, Doug. See my earlier response regarding Chill E. B. Told to marry now? I don’t know but I smell a reg, I mean, rat. First time I heard that one, Ha! Wow – not surprising – you spell it out very clearly in several posts – those that were regged over and over eventually have nothing left to be reg. And there are more and more people waking up and seeing what really has been going on. Well, finallyawake is also getting a post going on michelle seward’s story. What a relief to start speaking out and uncovering the trail of how some be set up. Look at it if you have a chance. michelleseward.tumblr.com Again, thanks for your posts. Thanks for the link Nana. It feels right to get the word out on the harassment and uncover what is really happening. The truth does have to be told in every way we can. It sounds like a dictatorship at work. Well this should piss off the remaining clubbed seals. The property owners are losing income; the tenants are paying a premium for lodging. It looks like your fan base will once again be expanding Mike – keep up the good work. Yeah, I wouldn’t stay there. That’s where they killed Lisa McPherson. Maybe Anonymous should hold a convention there. Good one. Be sure to ask for group rates. As a matter of fact, I read somewhere that there is such a “convention” planned to be in Clearwater. I’m very hazy on the details. Yes, it is called “Flagged Down” and is about exposing the crimes of RCS. It is May 5-10th in Clearwater. Oops. Called just “Flag Down”. I am still calling a foul and “flagged” RCS for it. Here is a great video about it from Chris Shelton. It was expected and they have created their own problem by declaring (OSA) 100s of OTs and other parishioners; they do not care about your person when quotas have to be met as mentioned by one of the parishioners where, in the auditing room itself, 4 staff members kept her in until the person will donate to the IAS, This is not a made up story, it is a real one and it was after 2009. Besides this, for years they monopolized the lower Bridge keeping the Grades only at Flag, now the Orgs ‘assumedly’ can deliver them so that public is gone. However, as stats were up, together with Purif and Objectives, they missed proper promotional actions. But independently if they would have done them or not, the public is aware of the abuses perpetrated on staff and public alike. Another Wrong Why, the reason is ‘out there’, we have ‘nothing to do with it’ attitude. This move seems typically self-defeating, though. Local Scientologists offering to rent out private accommodations are no doubt just trying to generate a little extra income to help them withstand the constant regging that is a fact of life in Clearwater. They’re doing their best to “make it go right” — and Flag is doing its best to thwart them. In so doing, they are also discouraging out-of-towners from coming to Flag in the first place. But I guess “Doug at accomos” has got other things to worry about, as does Debbie, as does everybody trying to make their stat. How are the Russian’s going to learn English if there are no ‘guests’ in the clam hotel. This message speaks to a situation where the boutique business of Super Powerz is not generating the income forecast. Someone’s going into the RPF for that. I heard that they didn’t pay their liquor bill so now all alcohol has to be paid in cash. Are any of you readers hearing anything from still-ins about the percentage of people who rent outside accommodations when they come to Flag? Is it just the rich “whales” or is it basically across the spectrum? Any perspective on this from your contacts would be helpful in attempting to figure out the annual revenue from Flag… and that in turn helps us figure out when the RCS starts losing money. Thanks! I worked at Flag from 1985 to 2005. I spent about 10 years in the Flag Service Org FSO) and about 10 years in Flag Crew. I was even the Captain FC in about 1988/89. The majority of the arrivals to Flag are public who are on OT 7. There are usually about 1,200 to 1,500 people actively on the level at any given time. Those on OT 7 are supposed to go to Flag twice a year for a “6 month check”. It is basically a security check that is done at a rate of about $7,000 per 12.5 hours, known as an intensive. It is usual for the 6 month check to take 3 intensives over a period of about 3 weeks. That’s about $21,000 for the auditing, plus the plane ticket, plus the lost money being away from their job. Not surprisingly, the public drag their feet and try to only return every 9 months or even just once a year or longer, despite pressure form the “church”. An individual can generally expect to be on OT 7 for a period of 5 to 10 years. Of course, while the public are at Flag doing their 6 month check they are constantly targeted by various registration units for donations for things like IAS, translation of the tech, preservation of the tech, books to libraries, Way To Happiness, Narconon, Criminon, Mission starter packages, etc, etc. When I was at Flaf it was known that the average arrival would pay $50,000 before they left. The fact is that the OTs financially support all of Scientology. $1.7 a week. The real problem was the FSO had taken in over $500 million in advanced payments while their Reserve Accounts had been emptied. The FSO was delivering about $1.4 million a week in service. Basically they owed about 4 years of delivery. The FSO was averaging over $100,00 a week in Refund/Repayments. That’s money being paid to public who want their money back and want to leave the “church”. Now you can understand why the “church” no longer wants to follow their own policy regarding refunds. The money isn’t there for the orgs to pay back. Flag Crew has always been financially struggling from week to week. It makes about $225,000 a week. It had 200 staff in 1985 and it had 200 staff in 2005. It is desperate to have the public live and eat in their hotels. There is a list of what public are scheduled to arrive for the day/week. It’s called the Arrivals List. Public are told they have to stay on board. There are various reasons given such as, they need to be quickly available when called for session and they need to be free of outside distractions. If a public is found to be staying “off board” they are put on a routing form which basically sends them to Ethics and then to the Cashier. The OT 7s are the hardest to control and keep on base. Many find it financially beneficial to buy a condo or house in Clearwater that they can use when they come to Flag. This is especially true when a husband and wife are both on OT 7. There are also Scientology businesses where a condo or house in Clearwater is provided for the staff to use. Besides the financial reasons, the OT 7s have been around long enough to learn the ropes. They hate being constantly chased for their money like they are a dog in heat. They also like to stick to the diet they like and not the restaurant food provided. Flag Crew can’t get all the arrivals to stay on board, but they pressure as many as they can. A key statistic from an international management viewpoint is International Assets and Reserves. 15 years ago this was in bad shape, especially when viewed against the ever growing APUs (Advanced Payments Unused). Obviously APUs are a financial liability. Its money prepaid for a service that is yet to be delivered. That’s why you see the Repayment Line shut down and fought in court and you see all the attention on getting the public to do direct donations for buildings, books, projects, etc instead of something the “churches” would actually need to deliver, like courses and auditing. It’s all an effort to get the Assets and Reserves increased and the financial liabilities decreased. Internationally the APUs were quickly headed for a billion dollars. I know this is a lot of random information. I hope it helps. I just want to point out something regarding the Ideal Org scam. Most of the city “churches” around the world are lucky to make $10,000 a week income. From that about $2,000 a week makes it way to “international management”. Basically these “churches” require all kinds of baby sitting and yet do nothing for international Assets and Reserves. With the Ideal Org scam many of these struggling churches are providing “international management” with properties worth millions of dollars. Empty or not, that’s a MAJOR boost to the international Assets & Reserves statistic and the “balancing of the books”. Of course it also provides Miscavige with the props needed to create the illusion that the “church” is expanding and he is some great leader, which he desperately needs. Thanks Mat. It is always good to hear from you with detailed information that adds to the data base! Thanks Mat. Having the correct info on the true state of the bubble is much appreciated. great info mat. thanks. so in theory if everyone demanded a refund scientogy wouldn’t have the reserves to cover it. there has to be some sort of regulation that covers that. Thanks for the info! It seems to detail a strong reason things went from services to donations. “They hate being constantly chased for their money like they are a dog in heat. ” Boy you got that right, Matt. And many of the smart OT VII married couples on the level buy condos and go in with another couple or two and use their own condos when they come to Flag for all the reasons you said. It is just like a Hollywood set where you have store fronts and they are empty behind the front part. It is DM’s game to make it look to the Sheeple and Whales like he is expanding “our church.” He doesn’t care if there are people in them. It is just more real estate to add to his reserves stat and to liquidate when he needs money. How the sheeple can’t see this is beyond me. Thank you Matt for your valuable information. Mat, thanks a thousand times for such a helpful and detailed post. It’s very hard to get perspective on the financial data and on the thinking behind how they manage themselves financially. This is *extremely* helpful! White Star, that’s exactly the implication — that they can’t cover repayment of deposits. I did a long blog post on this scenario a week or so ago on my blog at johnpcapitalist dot com. Thank you, Mat. Its always good to hear this data from someone who worked inside as you did. I also immediately thought of insolvency reading your post. It’s an ominous picture. The shift of focus from services to buildings and books makes total sense, as the pretend empire crumbles. Perfect example right here. If you have a beautiful hotel in Tampa, it’s not hard to rent rooms. Basically, I don’t think they’re trying to get “everyone” in as they may have in the past. This is a very specialized service. JP – I have family members on OTVII. They have done a combination of both scenarios despite the pressure to stay on base, where they are under constant surveillance, along with the other crap they have to tolerate. They are not rich, or whales but would probably be considered in the upper income range of the middle class. I have been told by them that staying off base at the Residence Inn or some similar place is much cheaper than what the base offers, and that its also much quieter without the busses driving around after midnight, etc. They say in general that they get more peace and quiet off base and don’t get approached by org staff either. However, it does depend in the predicted length of stay. If the stay is planned to be a long one, then off base is better. If it’s a refresher, then they want to get in and out within a week and prefer to stay on base because they say its more convenient that way. There has been intense pressure to stay on base for at least the last 5 years or so, with people who rent out their condo space for stays getting into ethics trouble. People are still doing it anyway (renting out) and I suppose they are probably off the level or just withholding it because they desperately need the money to stay on OT7 and don’t want to lose their condo either. It’s been going on longer than 5 years. 10 years ago a friend started renting rooms out in her house to people coming for refreshers and she got pulled into ethics and told to stop it etc. So she went underground and it was all cloak and dagger and hush hush. But I saw her every day personally driving the public to the Sandcastle and picking them up at night to take them to her house. Nowadays she would be declared for that. I used to dread staying at Flag. I would be happy when I got there and the staff all looked so glum and beaten down. By the end of my stay I felt beaten down so then I fit right in and just wanted to get the hell out of town. I could, the staff had to blow if they wanted to leave. I hope the ones that are able to get out soon. Tony – I share the same sentiments. Also, don’t forget how Flag security will come into your room during the day and go through your personal effects. They distrust their public and want to make sure they know everything about them. Maybe they spy on their public staying on base for the most nosy, inane reason like what skin care products they use? I’ll answer that question and spare you inquisitors some spy time: Olay. Public that goes to Flag: preserve your privacy, which you have a “human right” to and stay off base. Don’t worry about flowing power to Flag. Flow power to yourself first. Remember, it all begins at home, within you. Flag has always wanted their public to stay at either the FH, HOC, or for us poor suckers who were Outer Org Staff the beautiful (please not the sarcasm) Hacienda (if you’re into concentration camp chic). Of course the idiots got rid of the Cabanas (which were used for auditing rooms which shows you how much of a priority the Mecca of Technical Deception placed on auditing )and made into them exclusive accommodations and pretty much gentrified the place for the rich then bought the Oak Cove which I think at one time was an assisted living facility for retirees or something. Which in true “Ideal Org” fashion gave them plenty of useless space (plus subsequent expense) and no one to put in it based on the inane “Field of Dreams” philosophy that if you build it or renovate it they will come. Well obviously no takers so far. So its obvious Flag is getting desperate. Me I think that eventually the Flag is going to go under and RI is going to be able to convert it into the Hotel and Casino they’ve always wanted there. remote, agreed and got it on everything, but what is “RI”? I think maybe Ramada Inn. Or a local casino it sounds like. RI stands for Resorts International which was started by Meyer Lansky and Santo Trafficante as a way to wash and rinse illicit Mob money. Rumor has it that they wanted the FH for a Casino but were unable to get gambling legalized in the State of Florida so they dropped the idea. With gambling becoming a major source of revenue for many states the legislature there might change their mind. Gawd, my dad was an OOT for Gag II. Right around the time DM showed up for Friday night graduations, the Hacienda got so cramped that all the OOT’s kept getting sick and infecting each other. Thanks to Mike Rinder’s blog, I knew the COB had just landed at Flag, so I kept asking him who had recently arrived at Flag because there has to be an SP making everyone sick. He blew shortly after that, and so did a bunch of others. The arrow that hit the apple. Thank you for your consideration to that matter. Yea Katniss. Way to go! Hi Remote – Yes, exactly. This has always been their policy but, in the past, there was only an occasional rumble about it because the FH (when it was pretty much just the FH) was full. Also, remember how you couldn’t stay in the same room unless you were married, no matter what your living arrangements at home? I wonder if that wasn’t a bid for more money, too. Of course, they said it “wasn’t appropriate” for an unmarried couple to stay together at “FLAG” because it would be a PR flap. If you noticed, Chill E. B. and his very nice girlfriend “eloped” recently. I like them both and hope that they finally hear what people are trying to say to them and quietly step away from the base. Fingers crossed. But my point is that I wondered if they were told to go off and get married because the “Church” is putting them up in hotels all over the world. I felt kind of bad seeing that they had eloped. With a family as big as he has, I’m sure they all wanted to be a part of it. Up in people’s business for sure. When I was there in the late ’80’s they were still too booked up to care if some of their FCCIs found accommodations off base. Also remember when NOTs was first released they were booking Pre OTs into Motels and other Hotels in Pinellas County because they ran out of room? Now the desperation is palpable. I have seen it change to become more desperate. I have stayed off base at a friend’s house on refreshers and was told it wasn’t flowing power to the base etc, and the accomos reg would glare at me when passing to make me know how bad I was to stay off base. But that was all. No one did any more than that. now I think it would be an ethics offense to do that. Also once a friend and I wanted to share a room with two separate beds at the Yachtsman and they wouldn’t let us cuz we weren’t married. It was just a ploy to get two separate room rental fees. And a friend of mine had a boyfriend and they wouldn’t let them stay in the same room so they concocted the lie that they were engaged and the marriage was imminent, so they were allowed to share the room. It’s all about money. Hacienda = concentration camp chic ….. ROFLMAO at how perfect this description is!!!! RTC Notice Concerning Properties and Rentals in the State of Florida. Per COB, it is now an instant SP Declare crime for any Scientologist to offer for rent, lease, sale, or otherwise make available any form of dwelling or shelter, or even a cardboard box, for the purposes of habitation in the State of Florida to any other Scientologist. The new rule is that all Scientologists who are not residents of Florida may only reside in, dwell at, or otherwise inhabit accommodations at Flag while they are in Florida for any reason whatsoever. The homes of Scientologists who are Florida residents are subject to surprise search by Flag Hotel Police; this to prevent any criminal harboring of Scientologists who are not Florida residents. Scientologists who are Florida residents are urged to immediately sell their homes and move to the Flag Land Base either as guests or as Sea Org members. Do they serve rice and beans? OTVIII – You had me going there for a minute about COB’s order that it is a high crime to rent any place in Florida and everyone must stay at Fraud Scam Base! LOL I don’t think that will be too far fetched in the very near future, especially when COB has been getting $1.5 million a week from his clubbed seals! Grrr8!, How will Dave’s sister pay off her legal fees, fines and continue to feed her habit if she can’t continue to be a slumlord? Wow, turf wars just like Al Capone the crime syndicate known as Scientology is battling the sheep kool-aide drinkers for dah dollars. Traditionally, Scientology Inc protects is market share of $$$ fiercely. But in this case market share is not being lost due to Customer indifference, but Customer fleeing and trying to escape from Vulture Culture Octopus tentacles.